My hair is getting too long. I’ve never had it long before so I thought I would go for it and just let it grow. Well, now it is to the middle of my back. Not only is it getting a little stringy on a good day, when I do curl it I look a little like the cowardly lion from the Wizard of Oz. Remember when they go to Oz for the makeovers? Today after I got out of the shower I towel dried my hair and then looked for my brush. 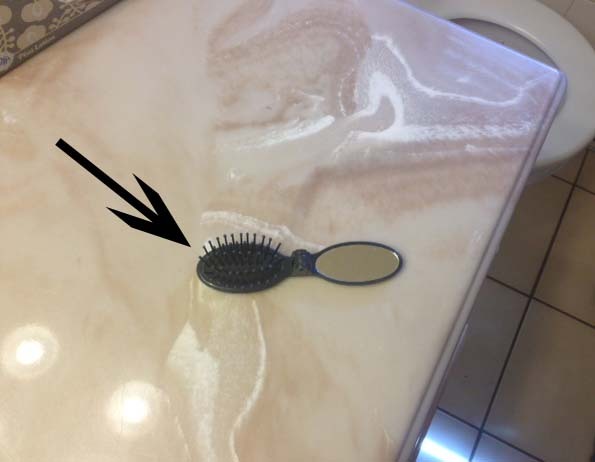 My brush was missing…again. This is the phenomenon that happens to mothers when their girls reach the age of primping. Common missing items are tweezers, razors, shampoo, makeup and, of course, brushes. This is the brush I ended up using. I found it by digging around in the bottom of the bathroom drawer. I don’t know if it is obvious from this photo, but my toothbrush is longer than this tiny compact “purse” brush.